I remember the first time that I heard of a panzanella salad. It was in my 30-Minute Meals 2 cookbook, and the recipe called for soaking stale bread in water, then wringing it out. My response can be summed up as "yuck." At that point I was still new to cooking, and even though I was becoming more and more open-minded about food, I couldn't get past the idea of panzanella being synonymous with soggy bread. Luckily for me, and for Andrew, who is now a lover of bread salad, my misconception was finally cleared up last year. I was reading through some old posts on my very favorite food weblog (of course you know that it was Smitten Kitchen), when I saw a picture that made my mouth start to water. It was Deb's adaptation of Ina Garten's panzanella, and after reading through the recipe I knew that I had to make it, immediately. Unlike Rachael Ray's bread salad recipe, which started with a water bath (and which I still have not had the gumption to try, even though the reviews on the Food Network's website are very good), Ina's started with toasting bread cubes in olive oil, which was enough to convince me to give the recipe a try. 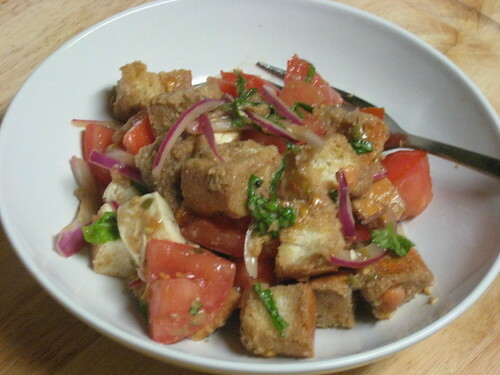 Andrew and I both loved it, and I have made panzanella many, many times since. My panzanella horizons were broadened even further when I found this recipe for Panzanella Caprese on Gourmet.com (I'm still waiting on the "exciting initiatives," by the way). At the end of the recipe for the Parmesan French Toast, there was a "cooks' note" with a link to a recipe for using leftover baguette. When I clicked the link and saw the recipe, of course I added the ingredients to my shopping list. I love tomato, mozzarella, and basil salad, and panzanella is one of my new favorites, so it seemed like a perfect combination (I only wish I would have thought of it before). This dish takes all of the ingredients in a Caprese salad: fresh mozzarella, ripe tomatoes, and a hefty amount of basil, adds freshly toasted croutons, and binds it together with a quick balsamic vinaigrette. Some thinly sliced red onion and capers add visual interest and a nice contrasting flavor. The toasted bread cubes absorb some of the vinaigrette and the fresh tomato juices, and become slightly soft without getting soggy. Looking back, it is funny to think that I was afraid of bread in a salad, seeing that now it is actually my favorite part of the dish. This panzanella makes a perfectly delicious light meal, especially with the unseasonably hot weather that we have been having here recently. The only problem for me is getting it to the table before I eat all of the vinaigrette soaked croutons. The notes for this recipe say that it can be made three hours ahead of time and refrigerated, but I don't like mine to sit for more than a half hour or so. If you want to make it ahead of time, I would suggest combining the tomato, onion, and cheese and refrigerating that separately from the dressing. The toasted bread cubes can be cooled and kept in a resealable bag at room temperature, then tossed with the salad, dressing, and basil 30 minutes before serving. Make croutons: Toss bread cubes with 1 tablespoon olive oil and 1/4 tsp, each, salt and pepper. Put cubes in a single layer on a sheet pan, and bake, tossing halfway through, 12 to 15 minutes, until golden. Make dressing: Grate garlic clove into a small bowl. Whisk in balsamic vinegar, capers, 1/2 teaspoon salt, and 1/4 cup extra-virgin olive oil. 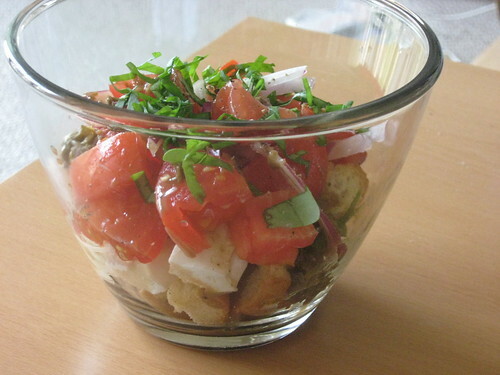 Finish salad: Place tomatoes, mozzarella, and onions in a large bowl. Add bread cubes, basil, and vinaigrette, and toss thoroughly. Allow to sit 30 minutes before serving.